Improved ability to localize sound, making it easier to know the direction of an alarm, honking horn, etc. Natural hearing is called binaural hearing – “bi” for two, “aural” for ears. Two ears work together to gather the full sphere of sound and deliver it to the brain where it’s almost instantly processed, giving the listener the ability to respond quickly and appropriately. Bilateral implantation merges sound from two ears so that your child’s hearing is better than with one implant alone. 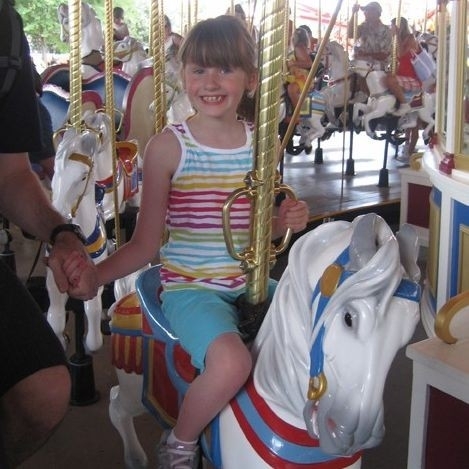 Two cochlear implants merge sound from two ears, giving severe-to-profoundly deaf children the opportunity to hear their world in surround sound, too. Binaural hearing is the optimal choice for your child’s speech, language, and communication development. Stimulating the hearing nerves in both ears early in a child’s life may improve their ability to listen, talk, and learn along with their normal-hearing peers. 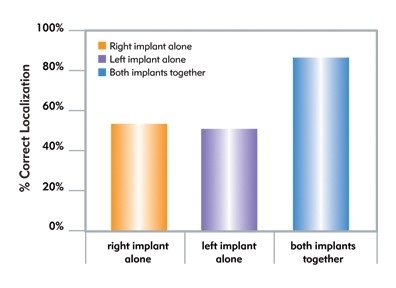 While the ability to develop language skills is strongest at a young age, older children who have depended on one implant for several years can still experience many benefits of bilateral implantation with a second one. Hear better in noisy environments like the classroom and playground. This allows them to focus on the important things like school – or play! Develop speech more naturally. Bilateral cochlear implants deliver surround sound to your child’s brain during critical periods for speech and language development. Localize sound sources more easily. They are better able to determine the location of a sound, like a friend’s “hello” or a fire alarm, and turn to it – giving them more confidence in social situations – and giving you greater peace of mind. 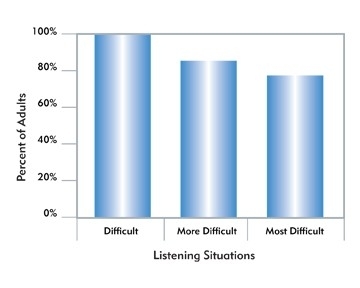 Listen with less effort. Less strain means your child can concentrate on learning. Sit anywhere to hear their best. When both ears work well, they don’t have to think about positioning themselves so their “good” ear can hear. Clinical research proves that bilateral implantation will benefit your child in their current day-to-day activities as well as in the future when they become adults and begin contributing at work, attending networking events, socializing with friends, or caring for children of their own. Two cochlear implants help adults interact with friends and business associates at noisy restaurants, clamorous parties or even during meetings. Adults who use two cochlear implant hear much better in noise compared to those with just one. Adult recipients can discriminate speech better with two implants compared to listening with one implant alone – even in quiet settings. From romantic dinners to parent-teacher conferences, bilaterally implanted adults recognize more spoken words. From ambulance sirens to honking car horns, adults with two cochlear implants can tell where sounds come from more accurately compared to using one implant alone, more like their normal-hearing peers. AB has provided a list of common questions. However, if you have a question you don’t see answered here, contact the AB office in your region. 1. Are the candidacy guidelines different for bilateral cochlear implant recipients? No, the guidelines are the same whether consideration is for one or two cochlear implants. To see if your child may be a candidate, take the online quiz. 2. Can my child hear well with two different processors? It is common for an individual to wait a year or more between their first and second (bilateral) cochlear implant. The ears collect and deliver sound to the brain. Therefore, a different cochlear implant system in each ear can work very well because the system is programmed for the unique hearing needs of each ear. 3. Can the brain bring the two sounds together, even if it’s been a long time since my child received their first implant? There is no reason to wait on choosing bilateral hearing. In children, the sooner they have access to sound, the better the outcome. 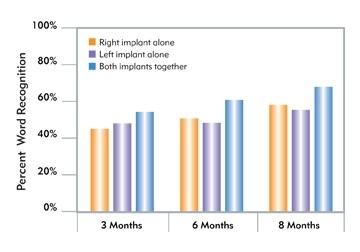 For older children, teens, and adults, experience with the second implant is key for the best hearing experience possible.3 Many individuals new to bilateral listening can notice an immediate benefit – which improves over time – including clearer speech, ease of listening, a more natural sound quality, and a new appreciation for music. 4. What would the advantage of going bilateral be for my child now as they hear very well and test normally with the first implant? Testing normally in the clinic and hearing well in the real world are not the same. An implant in one ear cannot compensate for hearing with two ears. Remember that hearing with two ears provides many advantages – localizing the source of sound, hearing more clearly in noise, and enjoying a richer experience with music. 5. My child still has residual hearing in their non-implant ear, is it better to have a hearing aid in this ear than another cochlear implant? Residual hearing doesn’t mean useable hearing, even with a hearing aid. The best way to know if an ear may benefit from a cochlear implant is to be evaluated by an audiologist. If you are unsure of whether or not you might be a candidate for bilateral cochlear implants, contact an AB Hearing Healthcare Specialist. 6. Will the implantation be quicker than for my child's first implant? The implantation experience is unique to each individual. Like technology, implantation practices can change and improve. Each person considering a cochlear implant should discuss the implantation procedure and expectations with the implantation team and audiolgist. Learn more about Implantation & Recovery and Initial Activation. 7. How will my child's second implant be financed? Financing options and insurance coverage vary by region. Contact the AB Office in your region to learn more. Balkany T, Hodges A, Telischi F, et al. 2008. William House Cochlear Implant Study Group: Position Statement on Bilateral Cochlear Implantation. Otology & Neurotology. 29: 107–108.